Among the theological students of Voetius and Hoornbeeck were scores of Hungarians who pondered the possibility of their kin and country being abandoned by God. Muslim Turks had occupied Hungary since 1526. Their cruelty and exploitation of the people shocked all of Europe. However, Jesuits and Hapsburg rulers, in the service of Rome, were the cause of even greater suffering. The liberation of Hungarian ministers at Naples by Admiral de Ruyter, 1676. The men pictured had been sold to a Spanish fleet to serve as galley slaves. Chained to oars day and night for nine months, some had struggled with the fear of abandonment by God as well as their fellow believers. The twenty-six survivors sang Psalms 46, 114, and 125 as they were being transferred to a Dutch ship on February 11, 1676. When the transfer was complete, they knelt on the deck in their rags and emaciated condition and sang Psalm 116. The Dutch seamen, who seldom shed tears, wept openly. How did the Dutch know that the Hungarians (who spoke no Dutch) were singing Psalms 46, 114, 125 and 116? Because they were singing them in Hungarian on the Genevan tunes. The Psalms are still being sung in Hungary in this fashion. But They Can’t Learn/Like Genevan Tunes! Really? Andrew Myers has an interesting story from early American history involving the Genevan tunes and native peoples. The tunes of Psalms 128 and 130 were especially favoured. I’ve been reading John Witvliet’s The Biblical Psalms in Christian Worship: A Brief Introduction and Guide to Resources . 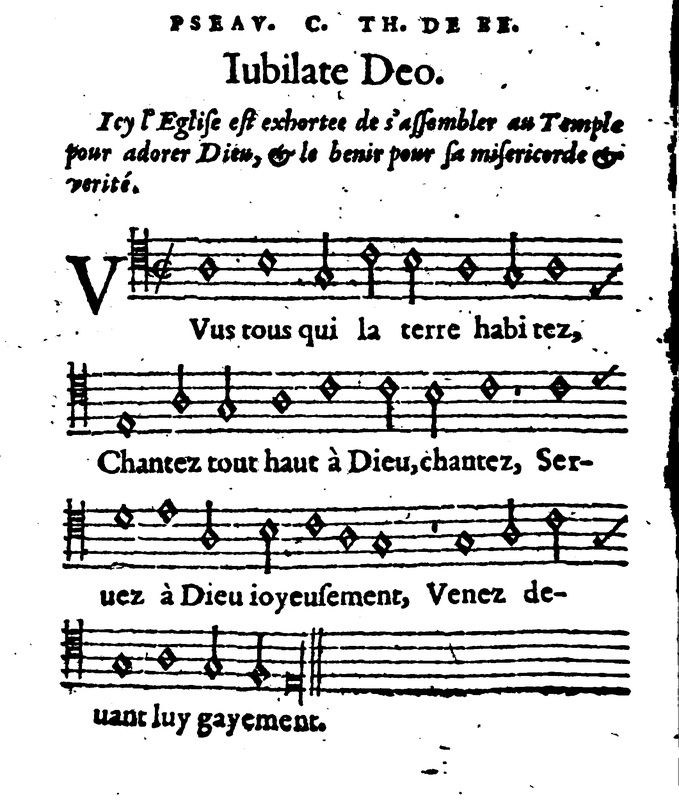 Witvliet suggests that there is value to singing through all the Psalms on a regular basis. He also remarks that has a historical basis: “In Calvin’s Geneva, despite the rejection of the Roman lectionary for Scripture readings and sermon texts, the Psalms were sung in public worship according to a regular regimen that was printed in the back of published Psalters (indeed, it was a lectionary for singing)” (51). I had a look at a couple of old Genevan Psalters (1565 and 1674), but I didn’t find any such “lectionary.” However, with some help from one of my colleagues (thanks, George! ), I found the original source which Witvliet references, Pierre Pidoux’s Le Psautier Huguenot du XVIe siecle. Pidoux reproduces a chart that is apparently found at the back of a 1562 Genevan Psalter. You can find it here. There are a few interesting features on this chart. The entire Psalter is sung through in a half-year. However, this involves a Wednesday service (Jour des Prieres), as well as the use of pre-service songs before the morning and evening Sunday services. It also sometimes involves determining the song before and after the sermon, thus taking this song selection out of the hands of the minister. Also, the singing of whole Psalms is the norm, although where the Psalm is long, it will be split up over two or more services. I think something like this could be used in twenty-first century Reformed worship services as well. I’m going to tinker with it and see what I can come up with. I agree with Witvliet that there is value in singing all the Psalms on a regular basis. One of my daughters has Psalm 100 for memory work at school this week (at our Christian school, the children memorize a psalm each week). After singing it during family worship, I got to thinking about the fact that there is another Genevan tune usually referred to as the Old Hundredth. This is the tune usually associated with “Praise God From Whom All Blessings Flow.” If you can sing that doxology, you can sing Genevan tunes! But that’s not the tune found with Psalm 100 in the CanRC Book of Praise. I was wondering where things got mixed up. How come we don’t sing the Old Hundredth with Psalm 100? I remember an organist once led a CanRC church to do exactly that, and I don’t even know if anyone else noticed. At any rate, I checked the 1565 Genevan Psalter available online here, and it appears to me that the tune in the Book of Praise is in fact the Real Old Hundredth. The question that I have, and maybe someone musical out there can answer, is: how did the tune for Psalm 134 come to be associated with Psalm 100, so that today people refer to it as the Old Hundredth? I suspect that it has to do with Scotland.